Our poster was a representation of a fish wheel built in more or less traditional manner. I think this exemplifies part 6 in that most fish wheels are rooted in the traditional values and methods yet incorporate modern technology and materials to accomplish the goal of feed the people. 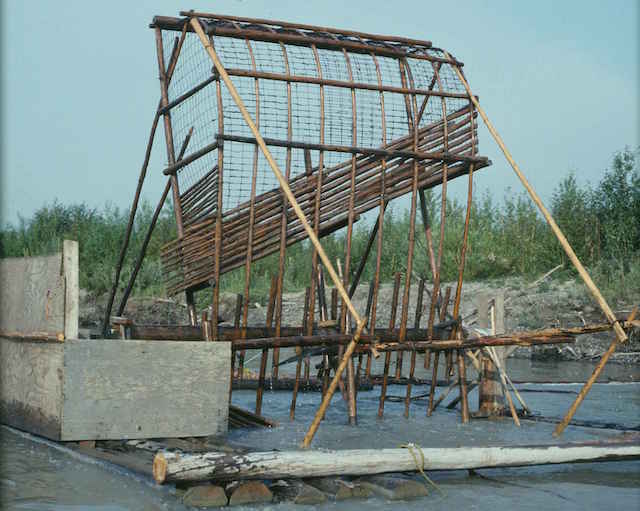 Moreover, the construction and use of fish wheel by subsistence users often are constructed by community members of multiple generations. There is passing of knowledge, not just of the fish wheel but of the fish, the river and the river environment. I believe it would be an easy lesson to adapt to the classroom as the connections are between the indigenous knowledge and methods and can be viewed also through a western scientific lens whether form a and engineering or biological perspective. Matt, great metaphor of the fish wheel. I haven’t heard that one before, but it’s a nice image! I think you are right on, in finding connections between engineering and indigenous technology. Matt, I like the fish wheel idea, great for bringing together the old- traditions, values, beliefs with the new- the use of modern tools and technology into the classroom.